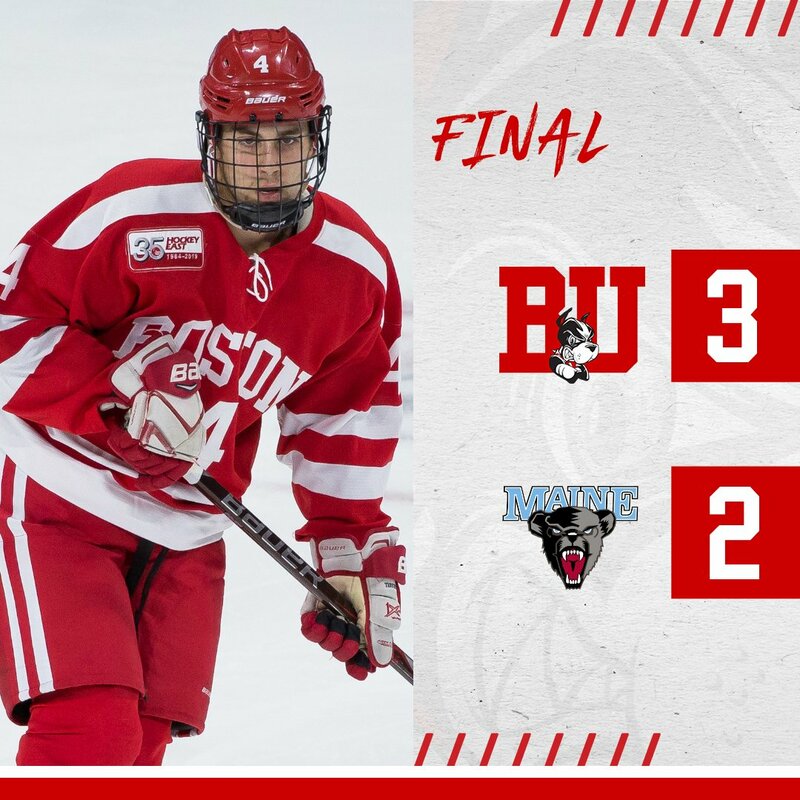 David Farrance's power-play goal late in the third period was the game-winner as BU edged Maine, 3-2, at Agganis Arena in the first of the two-game series. It was the Terriers' third man-advantage tally of the contest and allowed BU to stretch its winning streak to three and its unbeaten streak to four. The teams play again tonight at Agganis with a 7 p.m. start. Maine got on the board in the first period when an unmarked Eduards Tralmak beat Jake Oettinger with a wrist shot from the right circle. Thanks to a pair of BU penalties, the Black Bears had a first period 14-7 shot advantage. BU turned that around in the middle period pouring 22 shots on goalie Jeremy Swayman, who had shut out the Terriers last season. A Bobo Carpenter power-play goal evened the scored at 17:17 and two minutes later, Joel Farabee took a Chad Krys pass at the bottom of the right circle and whipped a shot through Swayman for a 2-1 BU lead. The lead held until just under six minutes left in the third period when Maine's Tim Doherty scored from the slot on a power play. With just under two minutes left in regulation, BU went back on the man-advantage. Farrance was set up at the center point by Patrick Harper and blasted a shot to the top corner of the net with Ty Amonte setting a screen in front on Swayman. Oettinger finished the contest with 36 saves while Swayman stopped 39 BU shots. 2019 recruit Trevor Zegras scored twice and added an assist to lead the NTDP U18s past Omaha, 7-1. Domenick Fensore and Alex Vlasic each recorded an assist. 2019 recruit Robert Mastrosimone has been named to the Team USA squad for the World Junior A Challenge beginning Dec. 9 in Bonnyville, Alberta. 2019 recruit Ethan Phillips will be playing for USHL Sioux Falls for the remainder of this season. 2021 recruits Roman Schmidt (Don Mills Flyers) and Danil Zhilkin (Toronto Marlboros) have been selected to play in the 10th annual Greater Toronto Hockey League all-star game set for Dec. 11. Sophomore goalie Corinne Schroeder stopped 26 shots to record her first career shutout as BU blanked Vermont, 3-0. BU received goals from Jesse Compher, Kristina Schuler and Mackenna Parker.